This looks like tomorrow's Guardian Editorial. 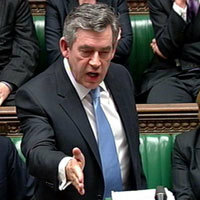 It has written off Labour Leader/Prime Minister Gordon Brown. It won't be the first time the Lib-Dem leaning mouthpiece has under-estimated his or Labour's powers of recovery. Should Labour bloggers refocus on own house? I have just commented on two other blogs about state-funding for political parties here and here. Another Blogger4Labour has just blogged on how the Times story alleging a Lib-Dem cash for honours scandal shows them playing catch by linking to Tom Watson MP. And that's fine, providing we the members are seen to be demanding that we put our own house in order. So shouldn't we Labour bloggers be focussing on that rather than having a few cheap laughs at our political opponents? Wouldn't we have a better chance of regaining the moral high-ground and regaining the trust of the electorate if we were seen demanding that our new Leader and the Labour Party National Executive Committee got their act together? I am absolutely convinced it would be easier to persuade the electorate to vote Labour, and politically aware active citizens to join Labour if the Leadership stopped looking to taxpayers to bail out previous mismanagement of Party finances, and committed us to sorting out problems entirely of our own making. When's that promised Bill on electoral issues going to be laid before Parliament? Labour/Lib-Dems to seek taxpayer bung to remain solvent? Reading between the lines of Gordon Brown's overture to the new Liberal Democrat leader as reported here every taxpayer should keep a firm hand on their wallet. The worthy goals of constitutional reform are, I fear, camouflage for the more urgent business of funding party politics. Lib-Dem support is needed to get proposed legislation expected to be tabled early in the New Year through the Commons. Brown is willing to include donation caps as well as spending caps by all accounts. Both party leaders face major financial problems of their own making, both parties have been seeking increased state funding for their political activities on the spurious pretext of cleaning up British politics. Will Nick Clegg adopt a principled approach and shame Labour by opting to rely on increased membership and small donations, in addition to pressing the case for electoral reform for the House of Commons? BBC's Daily Politics host Andrew Neil wonders if our Leader is finding his feet at Prime Minister's question time. Political corro Nick Robinson thinks he is. So do I. Cameron and Cable were nowhere. Pity about Brown rabbiting on about Hayden Phillips. But if it serves its purpose to wrong-foot the Tories over election spending, then it might just be understandable. To gain the moral high ground (difficult to image in the light of recent events), but worth a try, Labour must drop the idea of increased state-funding for political parties. Let's hope the White Paper promised yesterday by Jack Straw in the Opposition debate on Party funding is firmly based on the need to regulate spending, and eschews financial aid from the taxpayer. A Labour Party policy commission will be meeting later today to consider its stance. Liberal Democrat leadership contender Chris Huhne said on today's BBC2 Daily Politics TV programme that has written to Sir Ian Blair, Commissioner of the Metropolitan Police asking for an investigation into the Labour hidden donors affair. So Lord Ashdown declined an offer from Labour Leader-elect Gordon Brown to join his first Cabinet as Northern Ireland Secretary according to the BBC. The offer was made after Lib-Dem leader Sir Menzies Campbell had discussed Lib-Dem Lords being offered ministerial, not Cabinet posts as reported in the Guardian yesterday. Touch of the mischievous there, me thinks. Conclusions - an example of kite-flying in the interests of tribalism. GB unfurls by talking about embracing 'all the talents'. Targets willingness of Lib-Dems to embrace openness. Lib-Dems retreat into tribal huddle. Lib-Dem leader sets out terms of engagement (curiously omitting PR). GB tests loyalty of Lord Ashdown to his Leader, knowing the former Royal Marine officer would stand to attention to salute his current Commander-in-Chief Sir Menzies Campbell. GB let off hook to carry on being tribal . Perhaps he can forget about electoral reform too.